The official website for the upcoming Basilisk: Ouka Ninpouchou TV anime has announced additional cast members. A preview has also been revealed. The anime will broadcast on Tuesdays at 12:00 a.m. via Tokyo MX, Sun TV, KBS Kyoto, and BS11, followed by AT-X and tvk starting on January 9, 2018. The first two episodes will be pre-screened during an event on December 29. Tasuku Hatanaka (Hachirou Kouga) and Inori Minase (Hibiki Iga) will make an apperance for a talk show. 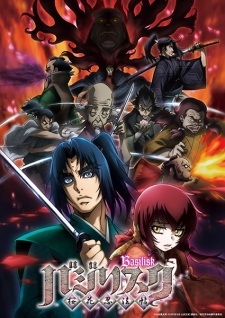 So, are the cast of basilisk previous season also appear in this anime. like kousuke toriumi, nana mizuki and miyuki sawashiro ? Well, I would be very happy if they turned out to be the children of the protagonists from the original, but the ending excludes it. But, if I understand you correctly, in this part the problem of clan conflict is no longer exists. Well, if it's generic advertising manga for 12 episodes, I'll be disappointed. I want at least 25 episodes with good drama. That is, unlike the original manga, is it more a "life story of two people" than the story of one war? The manga is not in English and I can't read Japanese. But as you can see from the main cast itself, the girl is Iga and the guy is Kouga but they both live together in the same group peacefully until one day a group of enemy appeared and attacked them with a bloody battle and a lot of death from the main cast's group and then time skip took place after that. The enemy group seem to be with the government. Also, both the girl and guy have eye's power. Here is a picture of them wearing their eye pad. Looks like its gonna be some damn good stuff, but still not as gory and dark as the first one. Guess i need to check the prequel series. @RobertBobert: The show will start out with them as children and go on for about maybe 6 episodes or so and then it will hit a turning point and then after that it will do a time skip 6 years later. This one has a different direction from the first series. Interesting trailer. I correctly understood that in the some episodes they will be children?